Sound masking is an electronic acoustic treatment used to control a facility’s background sound level. Though the sound—distributed via a network of loudspeakers—is often compared to softly blowing air, it is professionally tuned to meet a particular spectrum or ‘curve.’ The sound either completely covers up noises or reduces their disruptive impact by decreasing the amount of change between the baseline level and any volume peaks within the space. Similarly, conversations are either entirely masked or their intelligibility is reduced, improving privacy. When designing a sound masking solution, it is vital to limit the size of its control zones so the technician or acoustician can precisely tune the sound and, hence, deliver the specified masking curve to the client. Within this context, a control zone is a group of loudspeakers fed by a dedicated masking sound generator for which one can establish individual volume (0.5 dB steps) and frequency (1/3-octave) settings. Basically, smaller zones give the technician more control over the sound, allowing them to achieve a consistent masking effect throughout the installation. This illustration shows the placement of sound masking loudspeakers (i.e. the dark blue dots) regardless of what type of zoning is used. Best practice for closed rooms, such as private offices and meeting rooms, is to provide a control zone for each one. Whereas masking can be set as high as 48 dBA within open plans, closed rooms are typically set between 40 and 45 dBA. Providing each room with its own zone not only allows the technician to set the volume to an appropriate level, but also to tune the sound to provide a spectrum identical to the one used within the open plan. 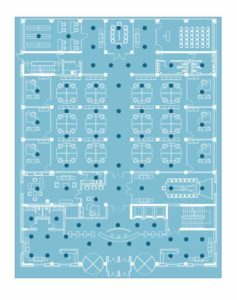 If a keypad is installed, this zoning pattern also allows the occupant to adjust the masking volume and paging settings according to their need or preference. While the reasons for not allowing a control zone to cross open and closed areas are obvious, it is also necessary to avoid creating one covering large areas of open plan. 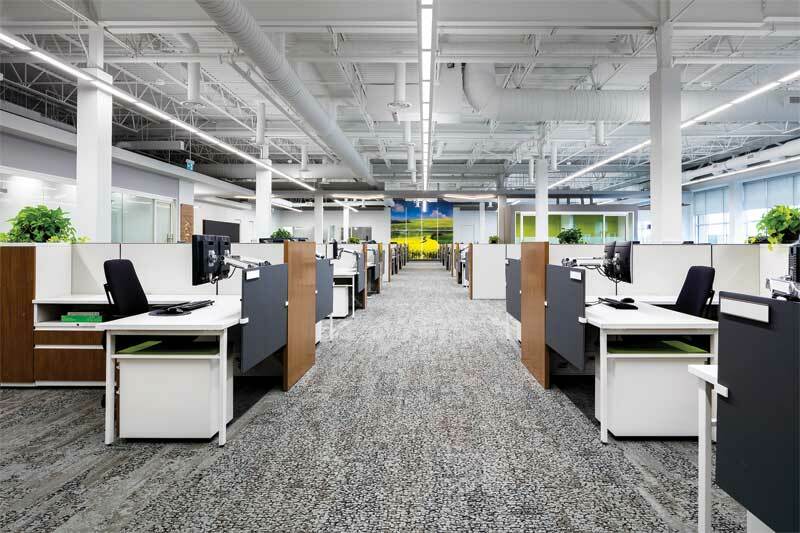 Though these spaces appear homogenous with their rows of bench seating or workstations, their acoustic conditions are usually anything but consistent. The unmasked ambient level varies across the floor plate—in some cases significantly, and even over short distances. The sound introduced by the masking system also fluctuates as it interacts with the interior’s layout, furnishings, and other materials. To achieve the desired sound masking curve, at the required volume, the technician must be able to address these local issues where they arise. 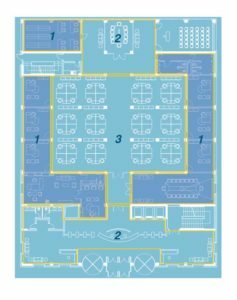 An example of a sound masking design utilizing a few large zones. 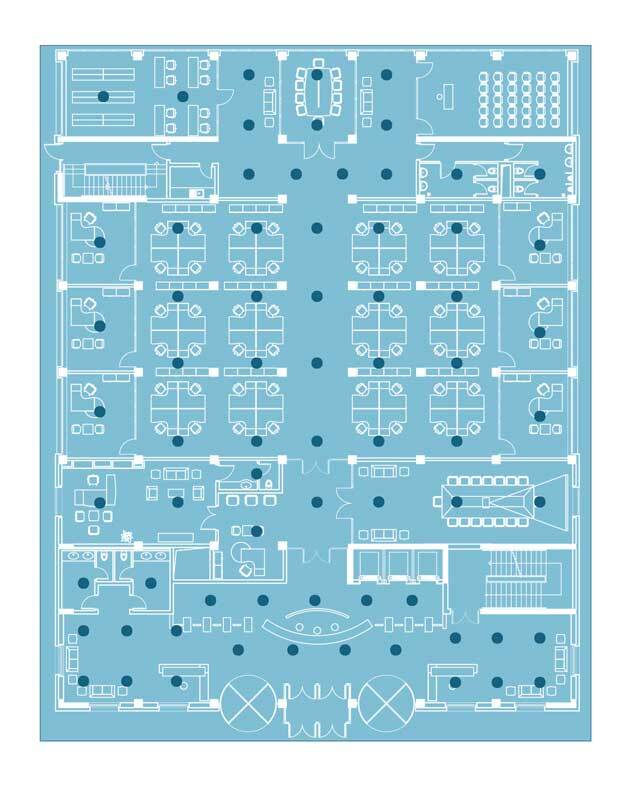 It assigns areas to simple categories such as open plan, closed room, corridor, and reception, based on the assumption they have the same or very similar acoustic characteristics. Note the volume and equalization settings for Zone 1 (highlighted) are applied to three different areas within the facility, encompassing seven private offices, three bathrooms, a boardroom, a waiting area, and a mixed-use room. Using single-speaker zones throughout the design is ideal from the perspective of maximizing the technician’s control over the masking sound, and modern technologies can easily be implemented this way. However, if the client’s budget requires a modest concession, it is acceptable to have up to three loudspeakers per zone across open plans, expanding coverage from 21 to 63 m2 (225 to 675 sf). This size still allows the tuning technician to adjust the sound’s volume and frequency to address local variations and achieve a consistent—and therefore consistently comfortable and effective—masking sound throughout the installation. Venturing beyond three loudspeakers introduces ever-escalating, tuning, and commissioning challenges. Though this decision might reduce the initial purchase price of the sound masking equipment, it carries a steep cost in terms of effectiveness, comfort, and flexibility. There are three key ways larger loudspeaker zones impact performance. In some sound masking systems using six- to eight-speaker zones, the output difference between the first and last loudspeaker in the zone far exceeds the allowable volume variation in common performance specifications. Technically, acousticians can address this problem—at least to some degree—by adding audio-transformers to the loudspeakers, but doing so adds cost and diminishes the system’s flexibility. Zone size affects how efficiently and cost-effectively changes can be made. The likelihood the client will need to make adjustments during a sound masking system’s 10- to 20-year lifespan is almost certain. Large zones limit their ability to reconfigure the system without first altering its design, moving loudspeakers, and/or rewiring. If changes are made to the physical characteristics of the space or to occupancy, modifications might not only need to be made to the masking sound, but also to paging, music, timer, keypad, and security settings.